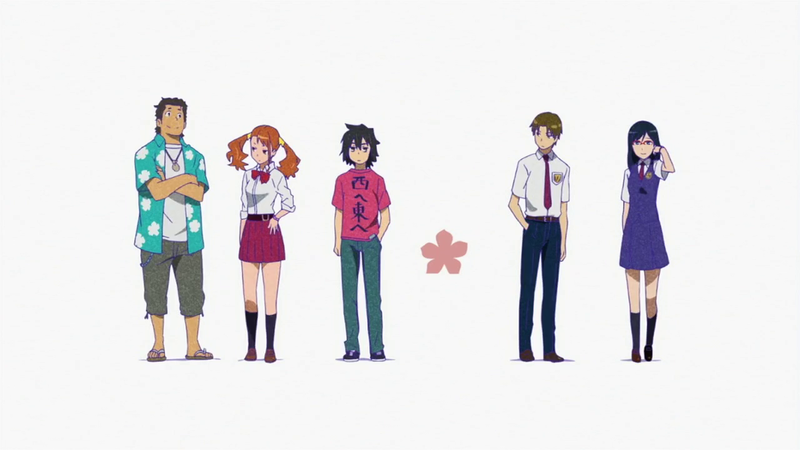 AnoHana (short for Ano Hi Mita Hana no Namae o Boku-tachi wa Mada Shiranai – We still do not know the name of the flower we saw that day) is a very touching drama. 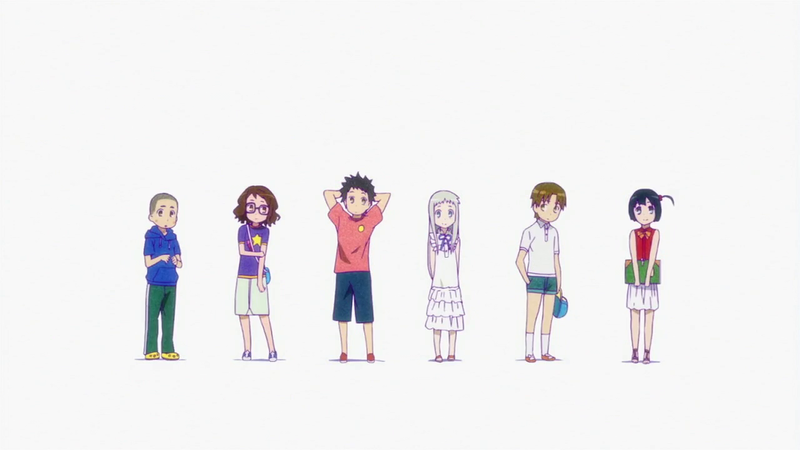 Like all other kids, there were six kids who are the central characters to the story. Like all other kids they made a small secret group and called themselves Super Peaceful Busters. Like all other kids they had a secret hideout where they met and planned to save the world. Until that day, when one among them died and their friendships started to drift apart. Years later the spirit of the deceased kid, Menma, appears before another kid, Jintan. She is unable to pass on because of an unfulfilled wish of hers. The years have taken a toll on her memory and she doesn’t remember what her wish was. To add to her woes, she is visible and audible only to Jintan. 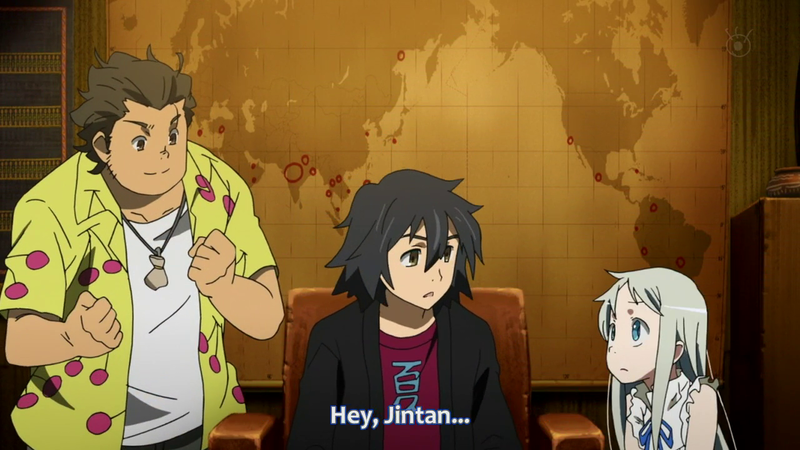 Jintan hopes that bringing his long lost friends together would somehow help him discover Menma’s last wish. This seems like a daunting task. They have drifted so far apart that they are not in talking terms with each other. The series is only 11 episodes long. 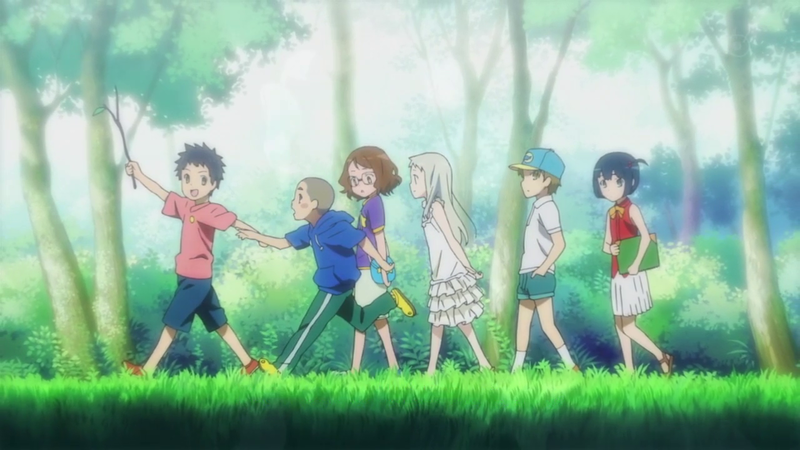 Through those half-hour episodes, bit by bit, the emotional turmoil that Menma’s death had on the kids is unfolded. Being such a short series, it is well suited for a nice calm weekend when your mind might yearn for some emotional fodder. What I found amazing was the way the director, Tatsuyuki Nagai, contrasted the effects of Menma’s death on her friends and that on her parents. Indeed, some may appear to be silly but given that the kids have different maturity level to handle such heavy loss, this doesn’t appear to be out of context. Menma’s death is also contrasted heavily with the death of Jintan’s mother – something that has made his father a bit carefree and has robbed Jintan of his ability to emotionally express himself. One by one, the other kids – Poppo, Anaru, Yukiatsu and Tsuruko – come to terms with the death and in turn with themselves as the series reaches to its satisfactory conclusion. I can’t praise the ending enough. It’s perfect. It leaves a lump in the throat and a very savoury feeling in your mouth. The animation is very well done by A-1 pictures. The flashback scenes involving their childhood have a haziness to them which contrasts well with the sharp animation that is used to depict the present day. I am usually ambivalent to opening and ending titles of anime. However, I was hooked to the OP (Aoi Shiori – Blue Bookmark by Galileo Galilei) and ED (Secret Base: Kimi ga Kureta Mono – What you Gave Me by Ai Kayano, Haruka Tomatsu, and Saori Hayami – the voice actresses of the girls in the series) in this case and never skipped them. Somehow they suited the tone of the series. So was the ambient piano work throughout the series. It managed to support yet never overpowered the scenes with an unnecessary emotional soundtrack. All in all, this was one of the best series I have seen till date. I can’t recommend this enough. I am yet to see any similar themed series. The series is up for streaming at Crunchyroll. NIS has recently released a standard edition 2 BD + 2 DVD set as well. Do you know of a similar series that you would like to recommend me? Please leave a comment below.